Superb three bed penthouse apartment in ideal location overlooking Salthill Promenade. This top-class property enjoys a south west facing aspect and the views across Galway Bay can be appreciated from the private balcony. Accommodation includes three bedrooms with master en suite, generous open plan living/dining area, and fully equipped kitchen. Stira access to attic and ample parking available. Excellently located within walking distance of the city centre. The AMV is €275,000. An exciting opportunity to acquire a prime city centre residence with a private rear garden which boasts stunning views of Lough Atalia. Immediately adjacent to the sportsground, the home of Connacht Rugby, this property is merely minutes’ walk from Galway city centre, the g Hotel, The Huntsman, Wellpark Retail Park, and all local amenities. This property, in need of modernisation and refurbishing, will appeal to both the urban homeowner and an investor given its prime location. The AMV is €200,000. A three bedroom mid-terrace bungalow residence on Bohermore in Galway city. Situated just a short walk from Eyre Square, this well located property is in need of modernisation and is being offered to the market with approximately 750sq ft of living space. With on-street parking outside the front door, the house has a large rear garden which lends itself to further development. A great opportunity to acquire a starter home or a well located rental property. The AMV is €130,000. Located in the south Connemara Gaeltacht at An Cloch Mor, Baile Na hAbhainn, this traditional stone cottage has been sensitively renovated to retain a lovely warm feel. The current owner has transformed the 80sq m of living space to create a perfect ‘bolthole’ just 34km from Galway city. Its proximity to the Atlantic Ocean, Rossaveal Harbour, and the headquarters of TG4 make this a home that should appeal to a broad spectrum of potential buyers either as a holiday or permanent home. Ground floor includes open plan living area and master bedroom while the first floor loft has been laid out as two bedrooms, each with Velux windows, varnished floors, and built-in wardrobe space. The AMV is €150,000. A two bedroom duplex townhouse in the town of Oughterard, Co Galway. One of a small development of 16 apartments overlooking the Owenriff River, this spacious unit is well laid out and is ideally suited for a first time buyer or for those seeking a holiday residence. Being sold with private parking. Comprising c100sq m of living space, this apartment is in a fully managed development. The AMV is €80,000. An outstanding investment property at Glasan, Ballybane Road, Galway, with almost 10,000 students outside the door. Glasan is a purpose built student village located directly across from GMIT. Guaranteed occupancy and substantial income during the student year with exceptional yields. Full time management office on site with 24 hour security. As with the majority of the units in Glasán, this is a well presented two-storey townhouse property. Winters Management office on site with 24 hour security. The AMV is €98,000. An excellent opportunity to acquire a well located commercial high profile premises in Clifden, Co Galway. Located on Market Street, adjacent to the town square, and recently in use as a restaurant, the property is in need of some renovation and offers great potential for a variety of uses. Comprising c300sq m of space over three floors, with on street parking to the front of the property. Includes large kitchens and reception rooms and two large accommodation rooms on the third floor. The AMV is €220,000. This property comprises a ground floor mid terrace commercial retail premises with approximately 4,500sq ft of space over two floors. Built in c2005, currently vacant and has most recently used as a children's daycare centre. This part of a purpose built commercial estate. Within a short distance to Gort town centre. Steel frame portal building with external cladding and parking available. The AMV is €80,000. Circa 3.5 acres of quality lands located on the R469 Quin to Sixmilebridge road, immediately adjacent to Quin playground. The property has in excess of 50m road frontage with direct access via double gates off the R469. The entire boundary features natural stone walls, hedgerows, and fencing and offers the prospective buyer enormous potential for one or more homes subject to planning permission. The AMV is €25,000. Enquiries to DNG O’Sullivan Hurley on (065 ) 684 0200. Four bedroom detached dormer bungalow in need of some cosmetic repairs, set on a large site of approximately 1.3 acres with road frontage running right into the village of Inagh. Ideal for prospective buyers looking for a large amount of yard space. Enquiries to DNG O’Sullivan Hurley on 065 6840200. The AMV is €60,000. A three bedroom semidetached residence in the centre of Ballygar village. Comprising approximately 1,250sq ft of living space, this house is in a small development, which is close to all amenities and Ballygar National School. The AMV is €65,000. A well located detached bungalow residence in the town of Ballinasloe, Co Galway. Within a short walk from Garbally College, Portiuncula Hospital and the town centre. In need of renovation, the house is on a site of c0.3 acre and lends itself to further development. Comprising approximately 125sq m, with off street parking and a rear garden. The AMV is €95,000. A ground floor two bed apartment in Castlebar town, Co Mayo. Comprising 60sq m, this unit is located in a superb student accommodation campus and is adjacent to Castlebar train station and within walking distance from GMIT and the centre of Castlebar town. Finished to a high standard. An ideal investment property. The AMV is €40,000. Enquiries to DNG Burke Connolly Maloney, Castlebar, on 094 9027300. This is a two storey semidetached three bedroom house. Located in a housing estate in Castlerea town, it is within walking distance of all town amenities. Double stand-alone shed to rear of property. The AMV is €42,000. A three bedroom cottage located in the townland of Cashel near Glenamaddy in Co Galway. On a site of approximately 0.4 acre, the house measures c830sq ft and is in need of some modernisation. Just a five minute drive from Glenmaddy and all amenities. An ideal opportunity to acquire a starter home is a picturesque location in Co Galway . The AMV is €25,000. Spacious four bedroom property with potential to make a wonderful family home. The property is ideally located within walking distance of Ballymote town and all its amenities . The AMV is €25,000. This is a two bedroom apartment in great condition throughout with open plan kitchen/living/dining area. Located next to IT Sligo, it is an ideal investment opportunity in a fully managed student scheme. New to the market is this spacious four bed semidetached home extending to c128.20sq m, located in the popular estate of Fern Hill, Athenry. A four bedroom detached property comprising c1,800sq ft of living space. 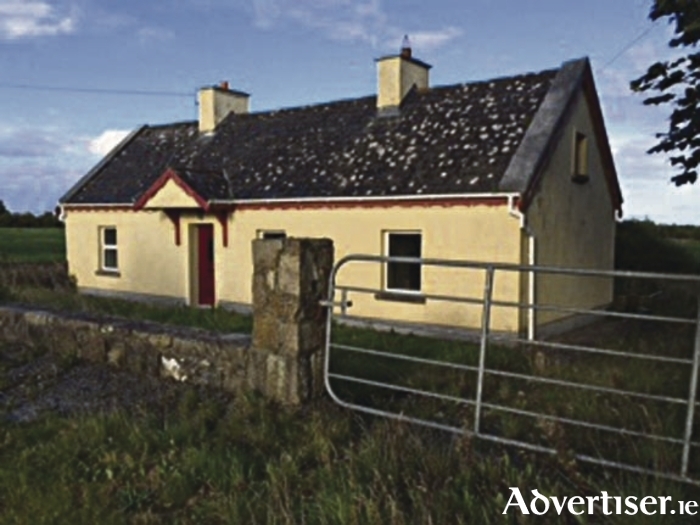 Located in the townland of Ballinvilla, the house is in need of renovation throughout. The property is situated 10 minutes drive outside Castlebar just off the Turlough road, in a much sought after location. All amenities are in the village including a museum. The AMV is €60,000. Located in one of Ennis’ most sought after residential locations, this bright and spacious home boasts uninterrupted views of Ennis town, while providing the ultimate in privacy with its elevated 0.5 acre mature tree bound site. All local and town amenities are just a five minute walk with Ennis Golf Club almost adjoining the rear boundary. A unique property with a very special address. The AMV is €150,000. A spacious two bedroom ground floor apartment in a modern development in Ballyshannon, Co Donegal. Well presented and ready to occupy, the apartment is located in the centre of the town and is within walking distance of all amenities. Being sold to include laminated wood floors, a fitted Shaker style kitchen, and tiling throughout. Parking included. The AMV is €30,000.